Ultra Vacucm Transformer Oil Filtration Plant includes pump which is provided with gas ballast valve to reduce the vacuum during operation and to prevent contamination of lubrication oil of pump with moisture, which is removed from the transformer oil in the initial stage. The plant is provided with suitable facility to ensure that, in case of power failure the vacuum pump is not sucked into the degassing chamber. The oil after purification, dehydration in the degassing chamber held under vacuum, will be drawn out by a discharge pump, which is of centrifugal pump gland less type. The above centrifugal pump is a gland less pump without any rotary seal. This gland less feature is to ensure total isolation of the conditioned oil from atmosphere, which in turn is necessary or maintaining the quality of the conditioned oil. This discharge pump has adequate capacity to deliver the required quantity of oil from the degassing chamber under vacuum and is capable of producing a head of 10 meters. All valves in oil lines are ball valves with Teflon seating and with stainless steel balls. These valves are leak proof and are suitable for vacuum and pressure application. Ball valves are provided for inlet and outlet. A bypass valve is also provided to afford internal circulation of oil within the plant itself. Two numbers mechanical non-return valves are provided, one before the degassing chamber and the other after the outlet pump so that in case of power failure or shutdown, flooding of degassing chamber or the plant with the oil from the storage tank is prevented, thereby preventing mixing of conditioned and unconditioned oil. All pipes are of good quality and all oil and vacuum connections are in the form of flanged joints with ‘O’ rings, ensuring full dealing efficiency at all times with minimum maintenance. A compound (pressure-vacuum) gauge is provided at inlet of the filter vessel to check the condition (clean or choked) of the filter cartridges. A dial vacuum gauge (Glycerine filled) is provided on the vacuum line to measure vacuum. Dial type temperature gauges are provided before inlet pump and after the filter vessel. This filter is provided with a suitable single point draining system. 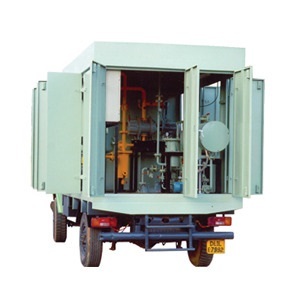 A sturdily built easily accessible control cabinet housing all the electrical control gears like contractors, circuit breakers, selector switches, isolators, digital temperature controller & interlocking features are provided. All the wiring is neatly routed and all wire terminals are suitably identified with number ferrules. The control panel is provided with a mimic diagram indicating the state of operation of vacuum pump, heaters, gear pump, gland less centrifugal pump etc. The wiring provided is of adequate capacity to handle appropriate load currents continuously.